Bubble mailers are one of two forms of optical media packaging specifically designed for mailing and other heavy-duty distribution of discs. 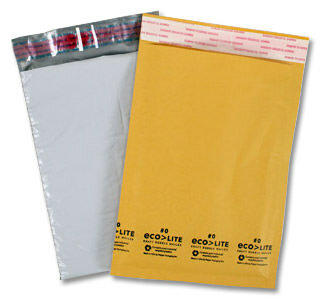 These padded CD mailers are lined and cushioned with bubble wrap to shield breakable contents from damage incurred during travel or shipment through the postal system. They are generally found in white, grey, or manila colored exteriors. Their size is tailored to meet a variety of multimedia needs. Measurements are generally (but not always) 6”x 10” or 7.25” x11” with oversize mailers coming in around 12.5” x 18”. A single CD/DVD bubble mailer can hold numerous discs in retail or other professional packaging such as jewel cases or Slim Paks. In addition, they have room to include letters, catalogs, price sheets, and the like to accompany the discs. Many are engineered with adhesive strips on their fold over flaps that are taped until time of use when they are peeled and fastened shut. They are made with a poly blend material to safeguard them from weather and tampering.